Alright, let’s get this out of the way first: growing up, it was basically a tossup as to which movie character I wanted to be more: Han Solo or Indiana Jones (The Karate Kid was definitely in the mix there too). And sure, as I've gotten older, my heroes and my tastes have changed. But it’s going to take some time to adjust to the new reality of Years of Living Dangerously, in which Harrison Ford and other silver-screen celebrities are now driving a project to help elevate the most important issue of our time. I’m still a little star struck. The second episode of Years continues a storyline in which Harrison Ford travels to Indonesia to investigate massive slash and burn deforestation projects, which are making way for gigantic, illegal palm oil plantations. The destruction of Indonesia's peat lands - the burning of both the forests' trees and carbon rich soils - now accounts for 4% of the world's total greenhouse gas emissions alone. Ford meets with local scientists, advocates and officials at several levels of government. Indonesia’s story serves as a healthy reminder of the important climate-regulating resources we still have in our own backyard. The forests of the Pacific Northwest are global champions at storing carbon. According to data from the US Forest Service, an average acre of Northwest forest stores 102 tons of carbon. See that elephant above? 102 tons of carbon is the equivalent of 34 of those in a given acre of Pacific Northwest forest. What’s more, thelarger, older trees in these forests – particularly on the west side of the Cascades – store carbon even more effectively than previously understood. As Jenna Garmon from our Northwest Biocarbon Initiative (NBI) points out, “with carbon dioxide levels in the atmosphere surpassing what is considered the safe upper limit, carbon storage may be the most important life-supporting function Pacific Northwest forests provide.” Right now, Jenna and several NBI Innovation Partners and others around the region are working to create economic and policy tools that foster better forest management practices. This week, Nebraskans and members of US tribes and Canadian First Nations will be in Washington, DC. 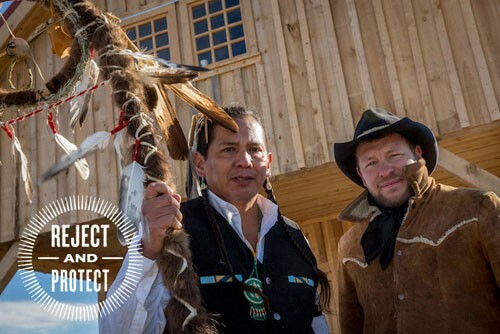 Our partners at 350.org have issued a new call to action, urging the President and Secretary of State John Kerry to meet with the Cowboy Indian Alliance. You can add your voice here. Another story in Years of Living Dangerously this week follows Arnold Schwarzenegger’s time with the Snake River Hot Shots--firefighters on the front lines of the growing crisis of wildfire in the West. The Snake River group is one of over a hundred elite firefighting teams created by the federal government to act as the last line of defense between people and wildfires. Ask any scientist with a focus on trees and they’ll tell you that fire is a key element of many healthy, functioning forest ecosystems. As Thomas Swetnam, Director of the Laboratory of Tree-Ring Research at the University of Arizona, explains: “Fire is not inherently bad for ecosystems. In fact, most land plants are well-adapted to fire at some frequency and intensity, and some even require fire to grow and regenerate." But, Swetnam continues, “The negative impacts of wildfires now, however, derive from a 'wicked' combination of changes in ecosystems, increasing numbers of people building their homes in fire-prone places, and increasing temperatures and drought." So if wildfires are a double-edged sword, one edge is getting sharper and sharper. Global warming and the increased drought severity that comes with it are causing larger and more frequent wildfires. A recent study by Philip Dennison at the University of Utah confirms as much. “We are seeing a trend across the region; we are seeing it in deserts and grassland,” says Dennison, “The fact that we are seeing it in so many different ecosystems tells us that something bigger is going on here." Additional research by Dominique Bachelett and others suggests that our carbon-dense forests west of the Cascades will become increasingly vulnerable to fires. These trends also come with expanding economic and social costs. The federal government’s firefighting budget has been exhausted in seven of the last nine years, causing a drain on resources for other social services. In Oregon, 2013 proved to be thecostliest fire season on record, with the 2014 Legislature forced to backfill resources to catch up. With our forests and communities at risk and our economic resources threatened across the board, how long are we going to wait before Oregon leaders act and make a firm commitment to binding limits on greenhouse gas emissions? Last year’s Pacific Coast Action Plan from Governors Inslee, Kitzhaber and Brown along with British Columbia’s premier, was a great coalition-building step toward climate and clean energy action with achievable goals. Let’s be sure to hold their feet to the fire in the coming months. Bobby is former Solutions Stories and Media Manager with Climate Solutions. In that role, he worked to identify and engage new audiences for our programs and campaigns throughout the Northwest, with a focus on the Solutions Stories. Bobby spent six years as the National Representative at the Save Our Wild Salmon Coalition (SOS), mobilizing support to restore the Columbia-Snake River Basin, a watershed home to some of the world’s best habitat for wild salmon and steelhead in a changing climate. After receiving his degree in Political Science from the University of Oregon in 2003, he advocated on behalf of working people and the environment. In addition to SOS, Bobby has worked for the Service Employees International Union (SEIU Local 503) and America Coming Together, and volunteered for the Trout Unlimited, Elders in Action, and UNITE HERE. Bobby hails from central Pennsylvania and has lived in Oregon since 1998. When he's not working, Bobby can be found with his partner Jenny and their cat Jove, playing music with friends, out and about on his bike, or working in the garden.